Northumberland Shipbuilding Co of Howdon-on-Tyne. 1883 Harry S. Edwards built a shipyard at Howdon-on-Tyne in 1883. Some 75 ships were made here up to 1898. Edwards also owned repair yards at both North and South Shields - the North Shields yards were presumably Harry S. Edwards and Sons and Edwards Brothers. 1898 Edwards died, and his Howdon yard was acquired by Rowland Hodge, previously yard manager for C. S. Swan and Hunter. Hodge transferred ownership of the company to a new company with the Northumberland name. Sir Christopher Furness, the West Hartlepool ship-owner took a controlling interest. 34% of ships manufactured at the yard before World War 1 were for the Furness Group. The yard produced individual designs but spar-deckers and two-deckers became the main standard designs along with shelter-deckers. The yard also built some steamers for the Great Lakes, including the twin-funnelled Greek emigrant steamer Patris 4390/09 who could reach speeds of 16 knots thanks to triple expansion engines. During the war the yard was allowed by the Shipping Controller to build its own standard design of shelter-deck tramp known as the “F1”. 1918 The Furness Group sold the yard to new owners led by R. A. Workman of Workman, Clark and Co Belfast who were associated with Sperling & Company, London Merchant Bankers. Sperling and Company used the Northumberland company to create a shipbuilding combine, the largest in Britain under Sir Alex Kennedy. 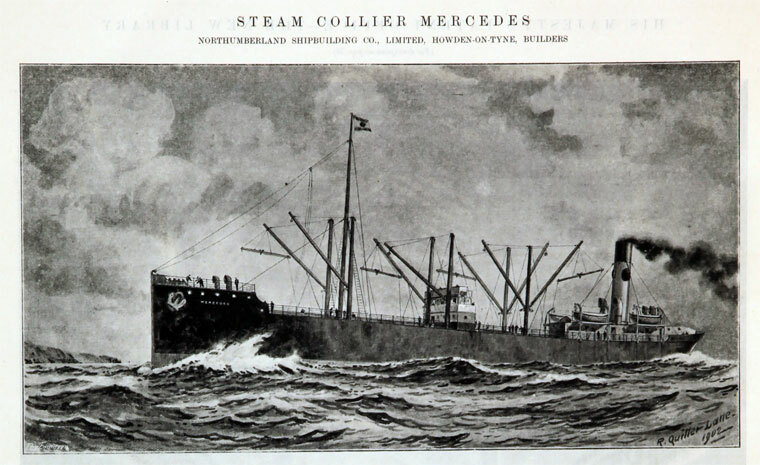 As a public company, The Northumberland Shipbuilding Co. Ltd acquired majority holdings in William Doxford and Sons of Sunderland, followed by Fairfield Shipbuilding and Engineering Co of Govan; Workman, Clark and Co of Belfast; Blythswood Shipbuilding Co; Monmouth Shipbuilding Co and the Lancashire Iron and Steel Co. The yard continued to build tramps for British and overseas owners. Its share values rose enormously during this period. 1925 The Sperling combine collapsed due to a lack of orders as the freight market became depressed in the early and mid 1920s.The problem was made worse by the Northumberland Company having ordered too much steel plate from Dorman, Long and Co – only half of the 300,000 tons was needed and the steelmaker had to be compensated £300,000 for the unused material. 1926 The yard was idle and a receiver was appointed. 1927 A new company was formed Northumberland Shipbuilding Co (1927) Ltd and the yard reopened. With seven berths and the capacity to build ships up to 600 feet in length, it went on to complete 18 tramps between 1928 –1930. In addition some coasters were also built for Coast Lines. 1930 Briarwood was the last ship to be launched by the yard on 27th May and after her completion in July of the same year, the yard was sold to National Shipbuilders Security Ltd and later dismantled. 343 ships had been built by the yard under the Northumberland name and a further 75 under the Harry S. Edwards name. This page was last edited on 21 April 2014, at 11:42.